That looks like an ampersand (&) between "pay" and "save" to me. I don't know, sounds good to me, Bobby. It's really hard to make out. That would make sense, though. This looks like it was a strip-type mall. I'm curiuos to know what 'Newberry' was though. Discount chain, or traditional department store? Dig that old script-lettered sign either way. This is a different view of Lloyd Center than I've seen traditionally. Most photos focus on the interior. It's a great shot, especially with that sweet Newberry sign. It was a Pay'N Save. This was a local drug chain here in the Northwest when I was a kid (60s). This was a great mall to visit. It had an ice rink in the middle, which I thought was quite classy. We used to stand above and watch the skaters. From a look at the directory, this view looks like it could be Halsey St. I would think the Newberrys could be the Barnes & Nobel and the Drug store Ross. 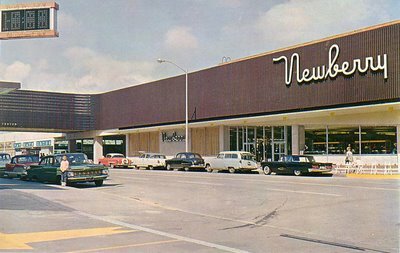 Newberry's was, at least in the South, a huge discount store. Pay 'N Save, for sure. I'd recognize that sign any time. We used to shop at one as a kid. It was a Seattle-based retailer. Newberrys was across the street from Lloyd Center and was there until the mid 90's. It could be reached via a undergroud parking garage below street level. Lloyd Center was originalyy an outdoor type mall that was enclosed in 1991. It still contains the ice rink on the ground floor of this 3 level urban mall. If I remember correctly, what is now Barnes & Noble and Ross Dress for Less, used to be Lamonts Dept. Store (at least in the '90's). The Newberry's sign persisted until about 2 years ago when it became Dollar Tree. It's still a *sort* of Newberry's, I guess - the modernized version. Personally, I'll take Newberry's ANY day. I loved those places when I was little, especially the smell - no modern business can duplicate it - candy, toys, plastic, old lady and pure joy. Their toy aisle had a magic that's matchless. I think they all had little lunch counters, too - the one in downtown Portland did - and it was a true thing of beauty, chrome and all. Thanks, Kev! 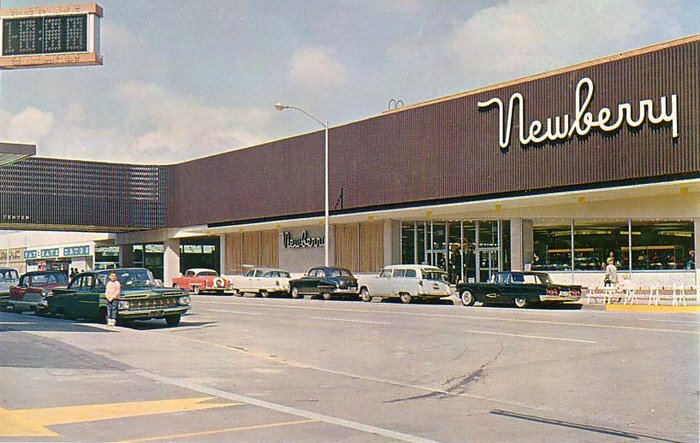 If people want to see the retro Newberry's signs, they are still retained in the surreal below ground level parking structure in that portion of the mall. Dollar Tree took over only one floor of the store. It was converted in 1997, as one of the last Newberry's left (Dollar Tree is the same corporate owner). I always enjoyed shopping at Newberry's and enjoyed the pet shop area down stairs. 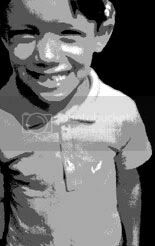 Love seeing all those old photos, brings back some memories. I remember the tree lightings, Cinnamon Bear, those cute reindeer they always had every Christmas. yes you are all right. It was Pay"n'Save and JJ newberry. The sign above the kid standing next to the car was time and temp. I should know I grew up looking at that sign every morning from where we lived. It was called portland federal savings. My sister and I played on our bikes under the lloyd center while it was being built. Security could never catch us we knew how to get around. I lived there from 1959 until 1971. I worked at the ice rink from 1966 until 1970. During summer walks at the lloyd center proved to be fun just watching people and smelling places like Joe Browns carmel corn. You can say we were the first mall children as the lloyd center was our play ground. J.J. Newberry's was a 5 and 10 started in Stroudsburg,PA in 1911,and was bought by McCrory Stores in 1972,Newberry's existed until 2001 as a spinoff of McCrory's.